The HD44780 is one of the first chips we learned about as a kid, and chances are good you’ve used one in your project at some point, and almost certain that you’ve interacted with one in your life. The character LCD is ubiquitous, easy to interface, and very robust. They come in sizes from 8 x 1 to 20 x 4 and even larger, but they almost all have the same pinout, and there are libraries in many embedded environments for interacting with them. [The 8-Bit Guy] decided to interface with one using just switches and a button, (YouTube, embedded) with the intent of illustrating exactly how to use them, and how easy they are. Once in a way we get a hack that makes us wonder – why didn’t we think of that ? [hydronics] tore apart an old LCD monitor and built a fish tank around it. Not sure if the fish notice that they are swimming on the Moon, but it sure makes for an interesting fish tank display. He starts by ripping apart an old 19″ LCD monitor and built an acrylic fish tank around the display. The backlight of the panel is fixed at the rear side of the fish tank, along with the rest of the electronics from the old monitor. For an earlier version, he built his own back light, but the second version with the original back light turned out much better. The fish tank pieces were joined together using acrylic glue and left over night to dry, although he still needed to use some silicone to plug leaks. A Raspberry Pi connected to the monitor’s HDMI input provides the background slide show. [Tony Rieker] helped add bubble animations via some OpenCV code running on the Pi. A live feed of the fish is overlaid on the slide show, adding a level of inception to this tricked up fish tank. The project was recently shown off at the Portland Winter Light Festival. Until about lunch time, the coffee goes pretty fast in our office. Only a few of us drink it well into the afternoon, though, and it’s anyone’s guess how long the coffee’s been sitting around when we need a 4:00 pick-me-up. It would be great to install a coffee timer like [Paul]’s Brewdoo to keep track of these things. The Brewdoo’s clean and simple design makes it easy for anyone in the office to use. [Paul]’s office has two carafes, so there’s a button, an RGB LED, and a line on the LCD for each. Once a pot is brewed, push the corresponding button and the timer is reset. The RGB LED starts at green, but turns yellow and eventually red over the course of an hour. Brewdoo has a failsafe in place, too: if a timer hasn’t been reset for four hours, its LED turns off and the LCD shows a question mark. [Paul] knew he couldn’t touch the existing system since his company leases the equipment, so the Brewdoo lives in an enclosure that [Paul] CNC’d with custom g-code and affixed to the brewing machine with hard drive magnets. Although [Paul] designed it with an Arduino Uno for easy testing and code modification, the Brewdoo has a custom PCB with a ‘328P. The code, Fritzing diagram and Eagle files are up at [Paul]’s GitHub. Pour-over coffee brewing is a simple and cheap hands-on alternative to using an automatic coffee maker. Although coffee aficionados often choose pour-over just for the manual brewing experience, this didn’t stop [Elias] from automating his pour-over coffee setup with an elaborate delta-robot: the DeBrew. The coffee-brewing robot is built around a delta assembly from a 3d printer controlled by a BeagleBone Black. 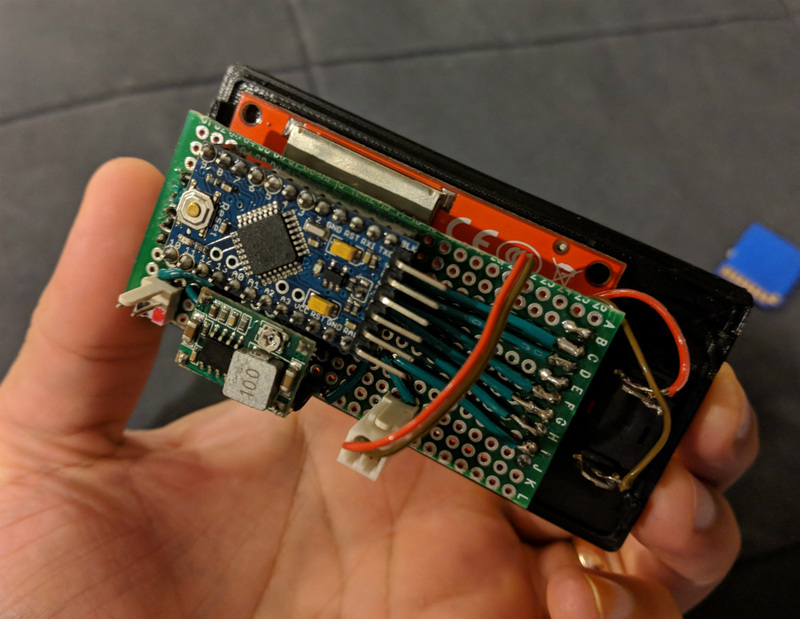 The BeagleBone drives stepper motors, displays information on a small open-source hardware HDMI LCD display, and serves up a web interface to control the machine. The radius of the pouring pattern, water temperature, and grind coarseness of the DeBrew can all be customized though its web interface. For those who want to build their own pour-over robot, [Elias] has made a SketchUp drawing of the design and all of his Python source code available as open-source. Check out the video after the break where [Elias] explains how his delta pour-over bot works. [Brett] just finished construction and long-term testing of this extremely accurate timepiece. It keeps such great time by periodically syncing with the atomic clock in Mainflingen, Germany. The core of the project is an ATMega328 which uses the new DCF77 library for decoding the signal broadcast by an atomic clock. The libraries written by Udo Klein significantly increase the noise tolerance of the device reading the signal, but they will not work with any project that use a resonator rather than a crystal. In the event of a complete signal loss from the atomic clock, the micro driving the clock also has a backup crystal that can keep the clock running to an accuracy of within 1 second per day. The clock can drive slave clocks as well, using pulses with various timings depending on what [Brett] needs them to do. The display is no slouch either: six seven-segment displays show the time and an LCD panel reads out data about the clock. It even has chimes for the hour and quarter hour, and is full of many other features to boot! One of the most annoying things about timekeeping is daylight savings time corrections, and this clock handles that with a manual switch. This can truly take care of all of your timekeeping needs!